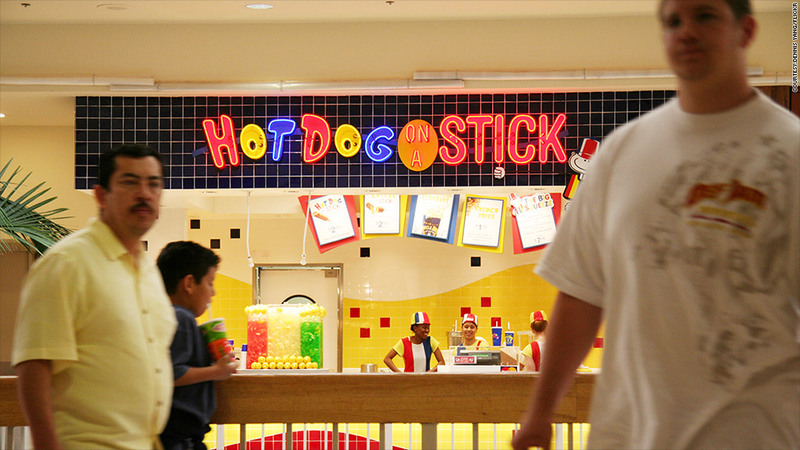 Hot Dog on a Stick just got a new lease on life. The popular West Coast corndog chain was rescued from bankruptcy via a $12.2 million deal, Thursday. The buyer, Global Franchise Group, also owns Great American Cookies, Pretzelmaker, MaggieMoo's and Marble Slab Creamery. It is part of private equity shop Levine Leichtman Capital Partners' portfolio, which includes Quizno's, another restaurant chain that filed for bankruptcy in March. Hot Dog on a Stick got its start in 1946 in California, when founder Dave Barham sold the famous corndogs on a Santa Monica beach and at county fair stands hooked up to his Lincoln Continental. It later became a staple in mall food courts in the 1970s, and even played a cameo in the 1982 movie Fast Times at Ridgemont High. But business dried up when the recession hit. Stuck with a bunch of struggling storefronts with expensive leases, the company filed for bankruptcy in February when it couldn't negotiate better rent.